Displaying Great Crested Grebes in winter plumage, on Thrupp Lake. On Saturday 3rd December we were joined by volunteers from other Earth Trust sites for a Bird Walk around Thrupp and Bullfield Lakes led by local naturalist and birder, Ben Carpenter, who pointed out and identified many of the birds, and Alison Vallance of the Earth Trust, who kept a record of observations and provided the promised mince pies (to the walkers, not the birds). The weather started cloudy and dull, with a light breeze, good visibility and thankfully not too cold. Later it brightened up with some sunshine. In the space of just two hours, 38 different bird species had been collectively observed – including most notably Green Sandpiper, small flocks of Redwing and Lapwing, displaying Great Crested Grebes in winter plumage (see above) singing Song Thrush, Kingfisher, Grey Heron, Redpoll , Wigeon, Mallard, Teal, Shoveler, Gadwall, Tufted Duck, and Pochard. Mallard Anas platyrhynchos Several pairs, on both lakes. Tufted Duck Aythya fuligula Many, on both lakes. Coot Fulica atra Many, on both lakes. Green Woodpecker Picus viridis In trees at NE corner of Thrupp Lake. 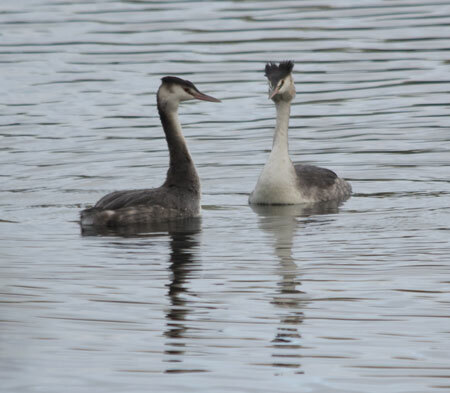 Great Crested Grebe Podiceps cristatus Several on Thrupp Lake. 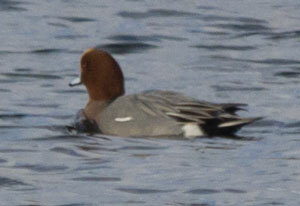 One pair seen and photographed displaying. Poised for the kill. 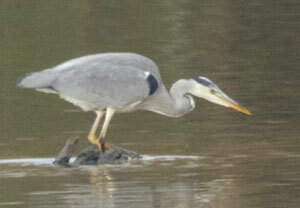 A Grey Heron stalking its prey. 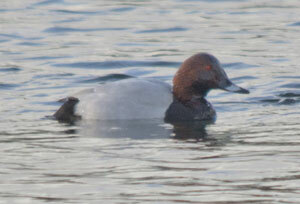 Pochard (male) on Thrupp Lake. 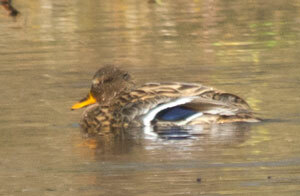 Female Mallard on Bullfield Lake.